A spokesperson said, “Atlantic Publishing House is going all out to celebrate its 40th anniversary in the publishing business having released such notable books as The Legend of Codfish and Potatoes, Bermuda’s Wooden Houses, Music on the Rock, and Football on the Rock, to name just a few. This year they have teamed up with The Leopards Club International to produce a variety of activities. “Atlantic Publishing House has also helped numerous authors over the years. CEO Butler expressed delight with the results of the recent Department of Culture Literary Awards when two of his plays, Sinnerman: Death in One Colour and The Second Last Supper were highly commended. “Mr. Butler expressed his joy with the selection of The Second Last Supper because it had just been performed in Cavite City, Philippines with an all Filipino cast and live band in June 2018. “This year, the group has eight activities planned covering a wide span of literary and cultural events affiliated with the publication of its books. Three are on the poster and added to them will be public lectures, awarding dinners honouring local entertainers and a series honouring our women writers. 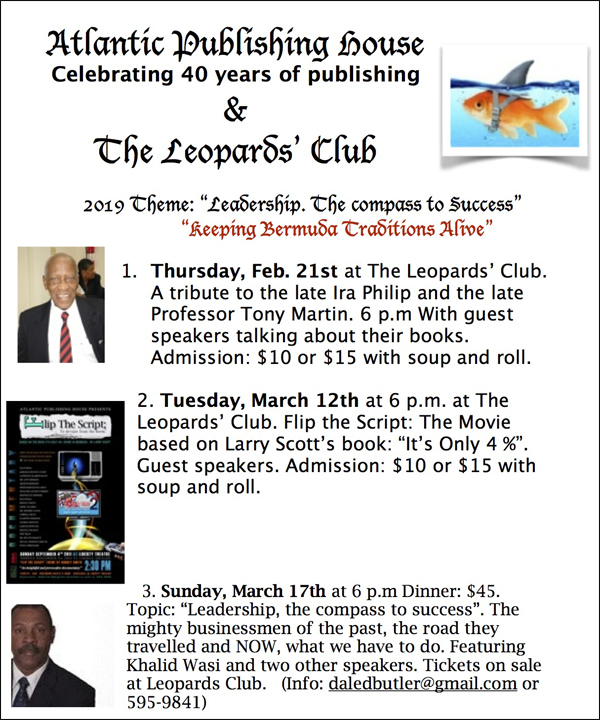 And of course one can never forget the Bermuda National Fishcake Competition open to young and old, amateur and professionals on Thursday, April 11 at the Leopards Club. “It was in 1994 that the group published Transitions: Voices of Bermuda Women as the first book to ever highlight what was exclusively on the mind of women like Meredith Ebbin, Lavern Furbert, Georgine R. Hill, Dr. Eva Robinson, Jo Carol Robinson, Rhonda Simmons, Shanda Simmons, Dr. Yvette Swan, and Kim Young. The first event, Transitions: Voices of Bermuda Women Writers, will be held In April and followed with a second in May, with both events giving out awards to women who are authors and have books for sale. “Perhaps the greatest contribution to Bermuda’s literary field by the group were two publications of Music on the Rock, which captured so much of Bermuda’s history. Dale , This is great news . You have always led the way , and on the behalf of all Bermuda , for your hard work and many contributions to local history and culture , THANK-YOU .